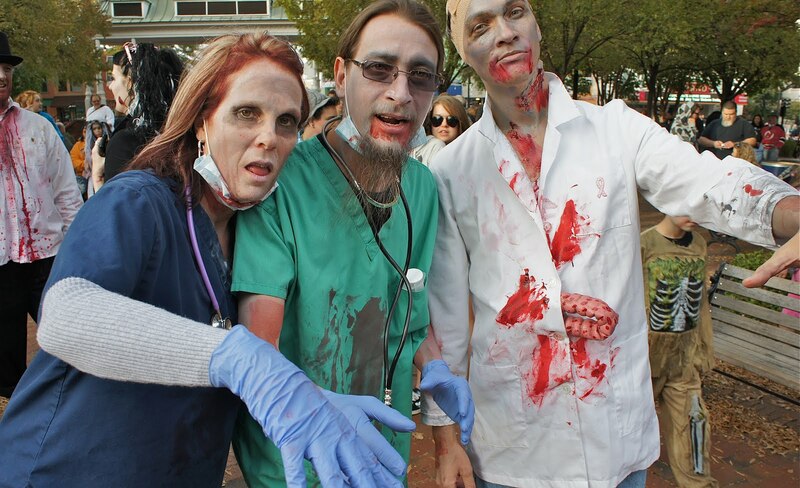 Among the questions the "Walking with the Dead" conference will tackle is why many people have embraced the zombie fad, such as these enthusiasts in Marietta Square on Saturday. Karen Rommelfanger’s husband got her hooked on “The Walking Dead.” She had resisted, but finally succumbed to the AMC TV series when her husband was watching an episode on zombie neurobiology set at the Centers for Disease Control and Prevention. “He called out to me, ‘You’ve got to see this,’” says Rommelfanger, a neuroscientist and director of the Neuroethics Program at the Emory Center for Ethics. The fictionalized researchers were gathered around a glorified brain scanner, discussing the “you” part of a brain, where thoughts reside, and whether the “you” part was gone. It wasn’t long before the Emory Center for Ethics coined the term “zombethics” and created a public forum to discuss them. “Walking with the Dead: An Ethics Symposium for the Living” is the brainchild of Rommelfanger and Cory Labrecque, a scholar of bioethics and religious thought at the Center for Ethics. All the reserved seats for the event on Wednesday, October 31, are filled, but people can still participate in the campus Zombie Walk, starting at the center at 11:30 am and proceeding up to Asbury Circle. Zombies are becoming as emblematic of Atlanta as the Varsity drive-in. “The Walking Dead,” filmed in and around Atlanta, has resurrected zombies and turned them into visceral symbols of all sorts of modern-day fears. “The show is full of ethics questions dressed up in zombie suits,” says Labrecque, who wrote his dissertation on radical life extension and teaches courses on personhood theory and religion and medicine. Since “The Walking Dead” is set in Atlanta, it seemed especially fitting to launch a zombethics conference here, Rommelfanger says. Zombies touch on fears beyond death, such as slowly disappearing to Alzheimer’s, or wasting away in a coma. “We are not equating real-life patients with zombies, we’re using zombies as an entry point to start a conversation about really difficult subjects,” Labrecque says. The conference panelists include psychiatrists, philosophers, religious scholars, physicians, CDC officials, historians, ethicists and neuroscientists. They will grapple with questions like: When is a human being no longer a person? What is free will? What does end-of-life care look like for those for whom biological death is not the end? How should healthcare resources be allocated when pandemics hit?